Sullivan & Cromwell has broad transactional experience advising life and annuity, property/casualty, health and managed care, financial guaranty, and other specialty line and multiline companies, as well as agents, brokers and reinsurance intermediaries. The Firm's clients are among the largest U.S. and non-U.S. insurance and reinsurance companies and intermediaries. S&C provides dedicated insurance expertise in corporate, mergers and acquisitions, capital markets, private equity, risk transfer, insurance regulatory, tax and litigation matters. U.S. taxation of insurance companies. The Insurance Group also advises on major policy coverage issues, particularly environmental and products liability coverage. The Group provides litigation expertise involving insurance and reinsurance coverage and claims matters and other disputes. The Insurance Group frequently deals with insurance departments in New York and other states, as well as with non-U.S. insurance regulators. 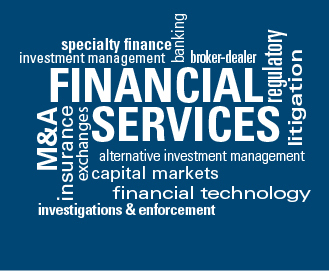 Together with the Firm's Banking Group, the Insurance Group works closely with U.S. federal banking authorities. Charles Steven Monat, in the sale of Charles Monat Limited to Willis Group Holdings. Goldman Sachs, in the acquisition of 50 percent of the share capital of the Hastings Insurance Group. Goldman Sachs, in the sale of 64 percent of the shares in Rothesay Holdco UK to funds managed by affiliates of The Blackstone Group, GIC Private and Mass Mutual. Tower Group International, in its merger with ACP Re. AXA, in the sale of AXA Private Equity (AXA PE) to a consortium of AXA PE management and other co-investors. AXA, in a pending acquisition of 50 percent of Tian Ping. BBVA, in the sale of a stake in AFP Horizonte to Grupo de Inversiones Suramericana and the Bank of Nova Scotia. BBVA, in the sale of its stake in AFP Provida to MetLife. Genworth Financial, in the sale of Genworth Financial Wealth Management and Altegris to Aquiline Capital Partners and Genstar Capital. Ally Financial, in the sale of ABA Seguros to ACE Group of Insurance & Reinsurance. Aviva USA, in the acquisition by Athene Holding from Aviva. BBVA, in the sale of BBVA (Panamá) to Leasing Bogotá, Panamá. BBVA, in the sale of BBVA Horizonte Sociedad Administradora de Fondos de Pensiones y Cesantías to Sociedad Administradora de Fondos de Pensiones y Cesantías, Porvenir, as purchaser, and Grupo Aval Acciones y Valores, as guarantor. Lightyear Capital, in gaining a majority interest in Cooper Gay Swett & Crawford. Lightyear Capital, in the purchase of Paradigm Acquisition from an affiliate of Sterling Partners. ING Groep, in the sale of ING Direct Canada to the Bank of Nova Scotia. Swiss Re Life Capital, in the sale of the U.S. portion of Swiss Re’s Admin Re division to Jackson National Life Insurance. UnitedHealthcare, in its acquisition of Amil Participações. Goldman Sachs, in its purchase of 19.9 percent stake in Enstar Group. Goldman Sachs, in the acquisition of equity interest in Taikang Life Insurance from AXA Life. ING Groep, in its sale of ING Direct USA to Capital One Financial. ING Groep, in the sale of most of its real estate management activities to CB Richard Ellis Group. ING Groep, in the sale of ING Clarion Partners to Lightyear Capital. ING Groep, in the sale of its Latin America pensions, life insurance and investment management operations to Grupo de Inversiones Suramericana. Medco Health Solutions, in its merger with Express Scripts. Pacific Life Insurance, in its purchase of the life retrocession business of Manulife Financial. Prudential Financial, in the sale of its global commodities business to Jefferies Group. Royal Bank of Canada, in the sale of Liberty Life Insurance to Athene Holding and Protective Life. Tokio Marine Holdings, in its acquisition of Delphi Financial Group. UnitedHealthcare, in its acquisition of XLHealth. AIG, in the sale of Alico to MetLife. AIG, advising with respect to U.S. regulatory approvals, in the proposed sale of AIA to Prudential. Allianz France, in the sale of Allianz AAM to Nexar Capital. Apollo Management, in its acquisition of Brit Insurance. Lightyear Capital, in the sale of the Nau Group to QBE Insurance Group. Lightyear Delos Acquisition, in its merger with Southwest Insurance Partners. AIG, in the divestiture of Transatlantic Re. AIG, in the sale of Hartford Steam Boiler to Munich Re. AmTrust Financial, in the sale of its insurance brokerage business to WesBanco Bank. CastlePoint, in its merger with Tower Group. Goldman Sachs, in its acquisition of Hanover Insurance Group’s life insurance business. IPC Holdings, in its acquisition by Validus Holdings, following the termination of consolidation with Max Re. Mitsui Sumitomo, in a three-way business merger with Aioi Insurance and Nissay Dowa General Insurance. Paris Re, in its acquisition by PartnerRe. ING U.S., in its SEC-registered IPO and NYSE listing. Essent Group, in its SEC-registered IPO and NYSE listing. ING U.S., in its SEC-registered common-stock offering. AIG, in its SEC-registered common-stock offerings. Unipol Gruppo Finanziario, in an international rights offering. Fairholme Capital Management, in the purchase of H shares of China Pacific Insurance (Group). AIG, in its SEC-registered common-stock offering. AIG, in its secondary sale of MetLife common stock. PMI Group, in its SEC-registered common-stock offering. Prudential, in its SEC-registered common-stock offering. ING Groep, in an international rights offering. Prudential, in the private placement of exchangeable surplus notes to Nippon Life. Prudential, in its first common-stock offering since its demutualization in December 2001. Fidelity National Financial, in its SEC-registered stock offering. China Pacific Insurance (Group), in its common-stock private placement. The Peoples Insurance Co. (Group) of China, its Rule 144A/Reg. S IPO and Hong Kong listing. New China Life Insurance, in its IPO. Dai-ichi-Mutual Life, in its IPO. At the time, this was the second-largest Japanese IPO to ever take place. Lincoln National, in its SEC-registered common-stock offering. AIA Group, in its Rule 144A/Reg. S IPO. At the time, this was the largest-ever insurance IPO. Lincoln National, in SEC-registered public equity offering. Ameriprise, in its SEC-registered common-stock offering. AXA, in an international rights offering. AIG, in SEC-registered medium-term note shelf offerings. Assurant, in an SEC-registered senior notes offering. Prudential Financial, in an SEC-registered junior subordinated notes offering. Sompo Japan Insurance, in Rule 144A/Reg. S subordinated bonds. AIG, in SEC-registered debt offerings. AIG, in an SEC-registered exchange offer. Mitsui Sumitomo Insurance, in a Rule 144A/Reg. S hybrid offering. Prudential Financial, in SEC-registered junior subordinated notes offerings. Unum Group, in an SEC-registered notes offering. Allianz, in Rule 144A/Reg. S insurance-backed notes. AIG, in an SEC-registered debt offering. AXA Global, in a Rule 144A/Reg. S insurance-backed notes offering. PMI Group, in its SEC-registered convertible debt offering. Prudential, in an SEC-registered debt offering. Navigators Group, in an SEC-registered senior notes offering. Farmers Exchange, in Rule 144A/Reg. S surplus notes. AmTrust Financial, in a Rule 144A notes offering. Aflac, in an SEC-registered senior notes offering. Lincoln National, in an SEC-registered debt offering. Aetna, in an SEC-registered senior notes offering. Fidelity National Financial, in an SEC-registered global notes offering. Nippon Life Insurance, in a Rule 144A/Reg. S callable subordinated notes offering. AmTrust Financial, in a Rule 144A convertible debt offering. Fidelity National Financial, in an SEC-registered senior notes offering. Ameriprise, in an SEC-registered debt offering. Mutual of Omaha, in a surplus notes offering. Pacific LifeCorp, in a senior notes offering. HCC, in an SEC-registered debt offering. Guardian, in a surplus notes offering. Aflac, in its SEC-registered senior notes offering. Pacific Life, in a surplus notes offering. Ameriprise, in SEC-registered senior notes offerings.